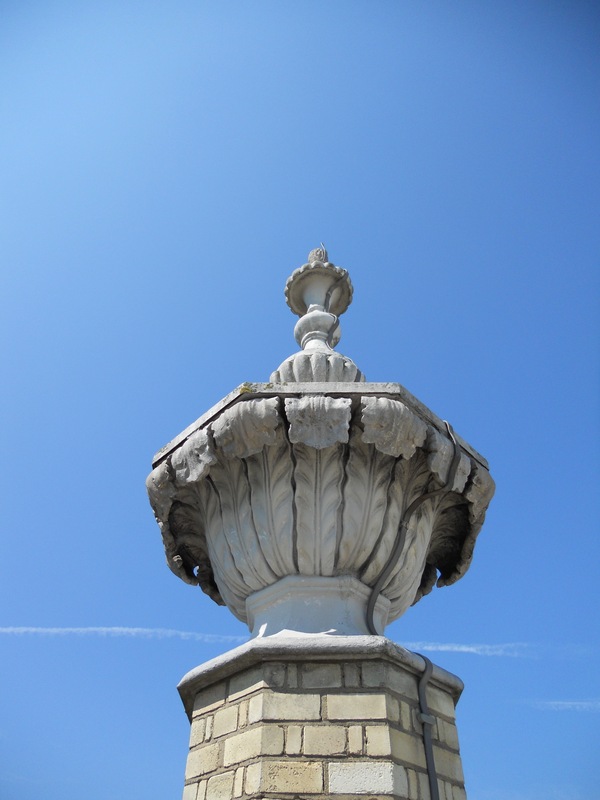 I began writing a quadrilogy of columns on Brighton’s famous Dome at the end of 2008 but, for all sorts of reasons, I never quite got around to finishing the fourth. A recent glorious morning proved to be the perfect opportunity to return to the building’s roof to take some photographs of the Dome’s dome up-close. Thinking back, previous attempts to get photographs were thwarted by scaffolding and bad weather. Matt Ashby from the maintenance team was kind enough to show me around on this particular visit – on a day with the bluest of skies. The roof is reached via a narrow spiral staircase from the mezzanine level just above the recently-refurbished foyer bar area. The staircase suddenly opens out onto a huge expanse with views of the Corn Exchange, museum, and Royal Pavilion. The dome itself has raised areas which were once windows but it is now entirely lead-covered. Although they are not pretty, the various air-conditioning units which inhabit the roof are features. There are actually two domes – an inner dome and an outer dome – and a cavity exists between them. 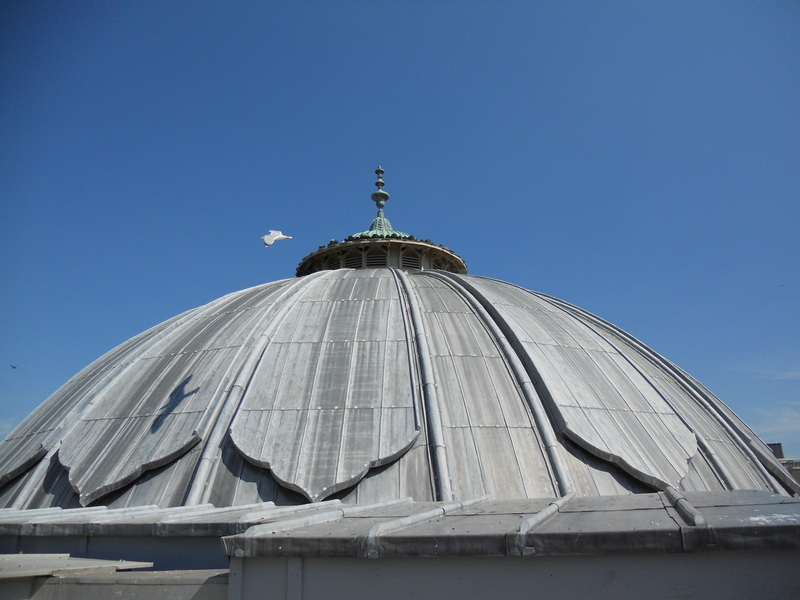 The outer dome, that which I saw from the roof, is the building’s original dome. The inner dome was added as part of Robert Atkinson’s Art Deco renovation that took place in 1934-5. Within the narrow cavity, it is possible to see parts of the old paint scheme (presumably part of Philip Lockwood’s works which saw the conversion of the building from stables to concert hall in 1867). Also, it is pretty clear from within where the window openings were which once let light flood in. Although it is hard not to be overwhelmed by the Dome’s Art Deco interior, some of the most fascinating areas of the Dome are the least glamorous. A myriad of complicated mechanisms in front of the stage, beneath the auditorium, can be moved to facilitate the needs of different performance routines. I was interested particularly though by some of the dressing rooms below which have been named after greats such as Wlliam Porden, the architect of the original building. They might have accommodated some of the world’s biggest stars but as basement rooms off narrow corridors out of the view of the public, dressing rooms without windows are not likely to be glitzy. Nevertheless, if walls could talk, I am sure that they would have some pretty interesting stories to tell.